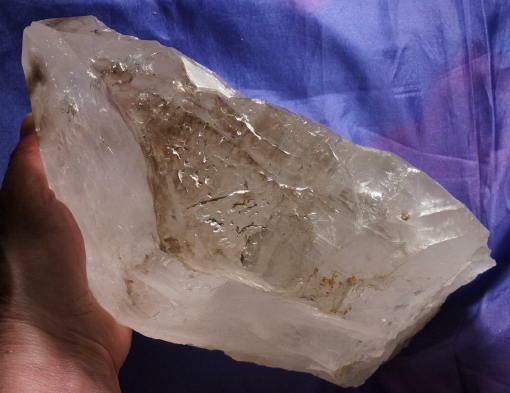 This is an astounding, altar-sized, 9 lb 3.4 oz Atlantean Lightbrary Temple quartz from Brazil with waterfall keys on two sides. She is actually well-keyed pretty much all around and what sides are exposed show ancient starbrary glyphs. She is a light smoky citrine with the smoke zoned in areas and she is 10.6 by 4.3 by 4.2. There are absolutely amazing glyphs and several trigonic record keepers (upside down and indented) on her faces. They are like ancient records and create a real network of stories as you explore her. Her keys offer doorways and her remarkably tactile faces offer messages and stories ... and for her size, she has only a few tiny dings and would be remarkable in your altar spaces. She would love to stand upright in a nest of sand to hold her firmly in place. It's interesting in that so many of the Atlantean crystals are appearing now. Their energies are different than the Lemurians, more electric and more urgent. They all seem to be survivors who want to work with Keepers who are coming into their role as Light Workers and her trigonic markings are certainly verification of that role. This Spirit is a bold and gentle teacher, coaxing information, data and knowledge into true wisdom, critical to her Keeper's Spiritual advancement. She is wonderful for personal meditation, allowing a very heightened state of relaxation and contentment as the meditation proceeds. Anoint her with rainwater to allow her crystalline musk to rise so that you fully experience the total sensory stimulation. She is a true treasure and good counsel.